I think it is fairly safe to say that Steve Orlando really likes the Atom. Any Atom. 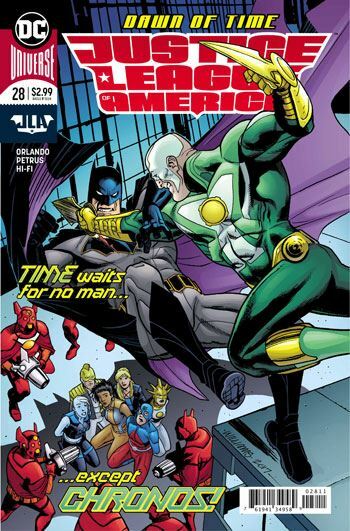 Ray Palmer has had a lot of play during his run on Justice League of America, and in this issue, Ryan Choi gets to star. The story is quite entertaining, although it does marginalize the rest of the team. That bothers me a bit, as the last issue had the same slant. And, as with the last issue, there are things I like in it, and some things I do not care for so much. The whole “god of heroes” concept doesn’t really grab me, and sadly it’s pretty central to the issue. On the plus side, Orlando develops Ryan Choi very well, putting the emphasis on how different Choi is from Ray Palmer, and how differently he puts the functions of the Atom suit to use. 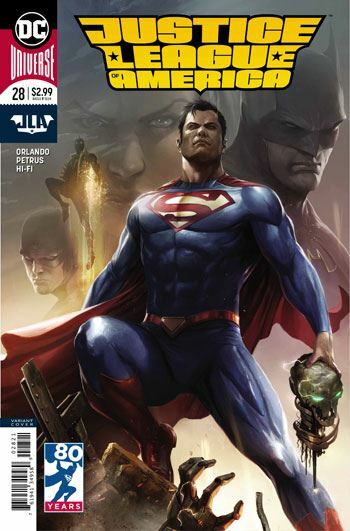 With Chronos as the main villain, it does make sense to give a lot of play to the Atom. But as I said, I am wanting to see more of the other members of the team. Especially since this incarnation of the League is nearing its end. I also have nothing but good things to say about Hugo Petrus’ art. He does some really great renderings of the heroes, and there is another villain who has a small role, and his strange appearance, and the contraption he is in, look wonderful, both impressive and silly at the same time. I also love that he has Black Canary’s fishnets getting tears as she fights. That very logical detail is rarely shown. I wish the bulk of the League were given more to do, but it’s still a darn good Atom vs Chronos tale.